The City Council voted to pass a resolution Wednesday that establishes Chicago as a "sanctuary city" and challenges Gov. Bruce Rauner's authority to temporarily suspend acceptance of Syrian refugees in Illinois following the deadly terror attacks in Paris. The measure is considered "symbolic," according to Ald. 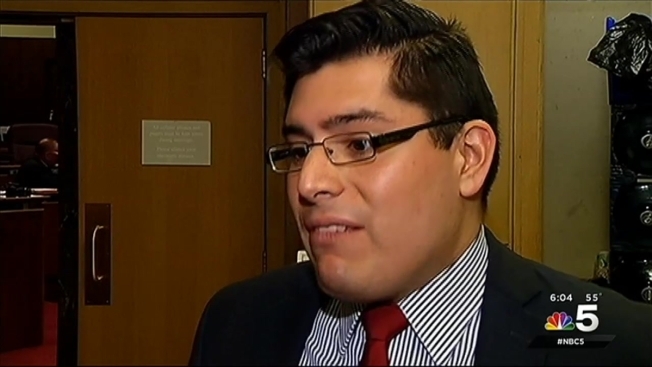 Carlos Ramirez-Rosa (35th Ward), who was one of the sponsors of the resolution. Ramirez-Rosa said City Council does not have the authority to decide whether Chicago accepts Syrian refugees, but he added that Rauner does not have the authority to refuse them either. "It cannot be in this moment when those in France have the courage to commit themselves to their values that we are weakened and walk away from," Mayor Rahm Emanuel said. "I'm honored that we've done this resolution. I'm honored that here in Chicago we speak up for what's right." The resolution was also sponsored by Ald. Ed Burke (14th Ward), Marty Quinn (13th Ward), Harry Osterman (48th Ward) and Danny Solis (25th Ward). The aldermen urged businesses and charitable organizations in Chicago to work with the United States Conference of Catholic Bishops to provide food and housing for Syrian refugees. A family who immigrated from Syria to Chicago in February with two sons, ages 9 and 2, was present at the City Council meeting to urge support of the resolution as well. "Many of us on the City Council have expressed the opinion that Gov. Rauner has no legal authority to block Syrian refugees fleeing violence from being placed in Illinois," Ald. Burke said. "It is our view that Chicago should continue its long and proud history of being one of the most immigrant friendly cities in the world. It is a metropolis that was built on generations of immigrants." As the aldermen debated passage of the resolution, a "Stop the CrISIS" event was being held at the College of DuPage in Glen Ellyn, where a packed room of people of all ages and ethnicities listened to a presentation about looking past stereotypes and taking a stand against radicalization. During the event, Imam Azam Akram led a candid conversation about the true nature of Islam in response to terror attacks in Paris, which were committed by extremists in the name of Islam. Imam Akram said that Muslims have a responsibility to speak out against the atrocity of these terror acts and let people know their religion does not promote violence. "We are loyal citizens of this country," Imam Akram said. "We are Muslims who believe in peace and tolerance. We try to promote that message." The governor's office released a statement following the passage of the resolution defending Rauner's position on Syrian refugees and citing security concerns as the reason. "The Governor has been very clear — we need to preserve our heritage as a state welcoming of refugees while addressing the all-too-real security concerns that continue to evolve every day," the statement reads. "A State Department official confirmed to our staff this morning that ISIS has demonstrated an interest in infiltrating refugee populations heading to the West. The official also confirmed that in recent years, some refugees admitted to the United States were later discovered to have terrorist ties. "At the same time, we continue to request briefings from the federal government on refugees being resettled to Illinois before they come — and the federal government has no official information sharing mechanism to coordinate directly with Governors on such individuals. As California's governor reportedly said to the White House chief of staff last night, the federal government must evolve with the threat and modernize their information sharing with state governments. This is a reasonable and responsible step to take to ensure we maintain a balance between compassion for refugees and security for our citizens." On Monday, Rauner joined several other state governors and declared that Illinois would temporarily suspend acceptance of Syrian refugees in light of the terror attacks in Paris. It remains unclear, however, if governors have the authority to deny entry to anyone granted federal asylum. Rauner said he has concerns about Homeland Security's screening process that allows refugees entry to the U.S. Several GOP candidates have also criticized the Obama administration's plans to accept 10,000 Syrian refugees and urged greater security measures. Officials said last week's gun and bomb attacks in Paris killed 129 people. One of the attackers had a Syrian passport, but it was not clear if the passport was real.